Roman Road Market has a rich and varied history, as befits its status as one of the oldest trading street markets in the country. ‘Going down the Roman’ has been an East End tradition for many years. But what is the history of the Roman Road and its famous market? Roman Road runs more or less parallel to the buried Roman road which connected London to Colchester, and was named as such when Roman remains were first discovered. According to map references, the first archaeological discoveries of the Roman road were made in 1845. Both the area and the road were famously taken by Boudica from Camulodunum (modern Colchester) on her way to fight the Romans in Londinium (modern City of London) and the road is one of the oldest known trade routes in Britain. 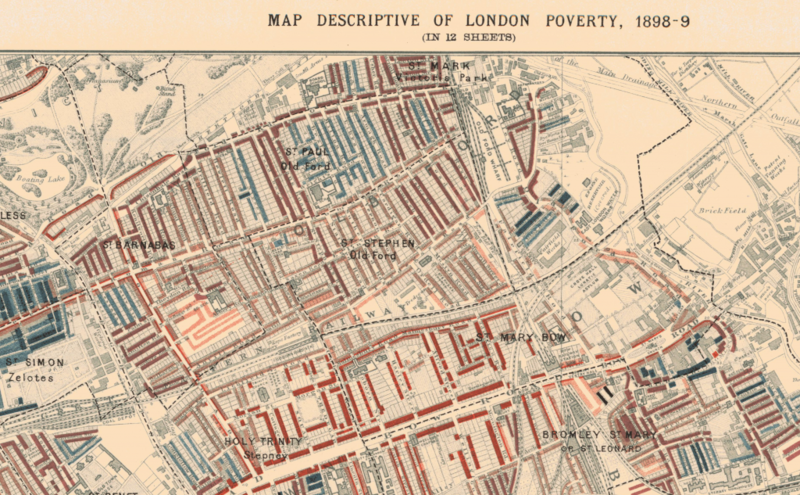 Detail of Charles Booth’s Map of London Poverty 1898-89 Sheet 1 showing Roman Road.The red areas are “middle class, well-to-do”, light blue areas are “poor, 18s to 21s a week for a moderate family”, dark blue areas are “very poor, casual, chronic want”, and black areas are the “lowest class…occasional labourers, street sellers, loafers, criminals and semi-criminals”. As roads were built, housing, trades and manufacturing, most famously the Bryant and May Match Factory, developed quickly. With housing and industry came the need for the essentials of life, and costermongers started selling their wares, people used their front rooms to sell goods and shops lined the Roman Road. 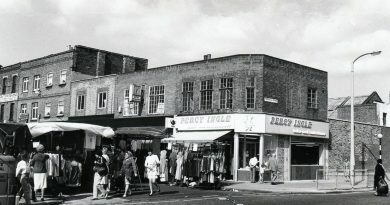 A main shopping street evolved and the Roman Road Market, which grew probably as early as 1843, when it was illegal ‘but withstood several attempts to close it down’. It was certainly recorded as a fully fledged market in 1887 by Charles Booth, who toured the area with the local policeman and reported that ‘Roman Road…is one of the great market streets in London. Things to be bought of every sort, even patent leather shoes. Some demand for good quality as well as for cheapness’. The market was legally established in 1888. It is at the heart of Bow, and ‘going down the Roman’ has been a tradition for generations. It was almost certainly a lively and bustling place. In 1893 there were 63 stalls trading in Green Street (one of the earlier names for the Roman Road) and by 1901 this had increased to 90. 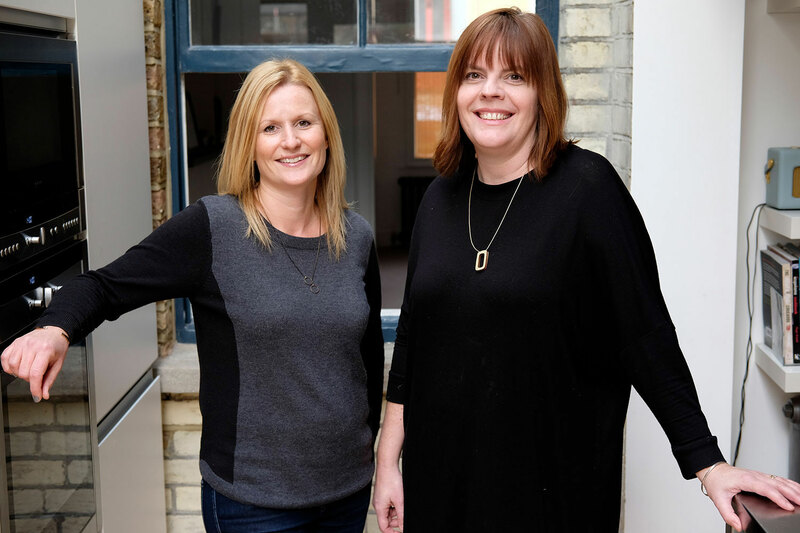 Late 19th century commentators remarked disapprovingly on the amount of cook, pie and coffee shops that were available in the area as so many women worked and lacked facilities for cooking. Typical market produce would have included fruit and vegetables, fish, meat, furniture and clothing. The market was open long hours: there are oral accounts of trading going on until 10 pm well into the 20th century. Nowadays the market starts packing up at 3pm and all traders dismantled their stalls by 4pm, or maybe 5pm on clement Saturday. Old Ford and Bow Traders and Shopkeepers Union was inaugurated in 1910 to promote the welfare of costermongers and traders as well as those they lived alongside, and there have been traders’ groups ever since then. 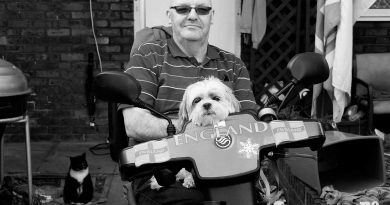 Harry worked on the market selling yams, sweet potatoes and bananas, underwear and jogging suits, hardware, and much more – including a job lot of barrage balloons he sold as car covers. The market was partly pedestrianised after the Second World War. The growth of traffic led to the council in 1959 trying to divert street trading to a new market off Roman Road. It met the same kind of resistance as the earlier attempt to promote Columbia Market. Two archways mark each end of the Roman Road Market. Erected in 1986, the archways are inscribed in Latin, alluding to the area’s Roman past. 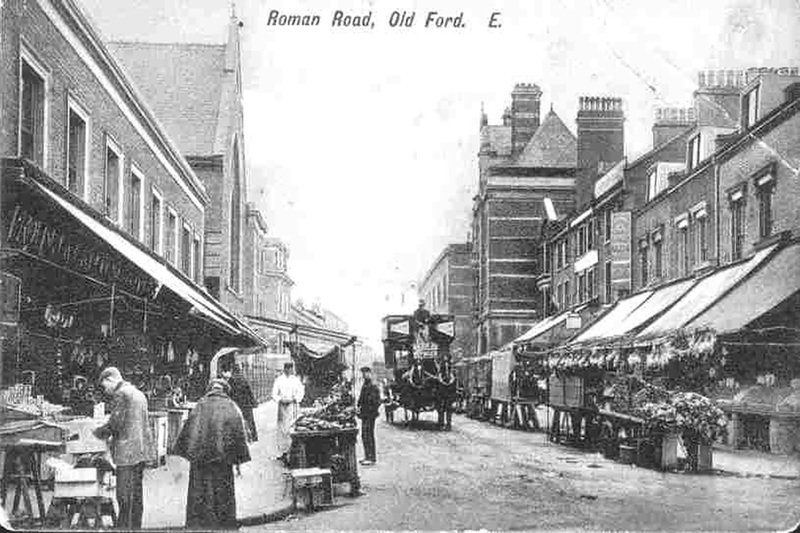 The Roman Road Market was designated a Conservation Area in 1989, and extended in 2008 in recognition of its historic significance and special character as a traditional East End market, like other open street markets in East London such as Whitechapel, Walthamstow, Barking and Romford. 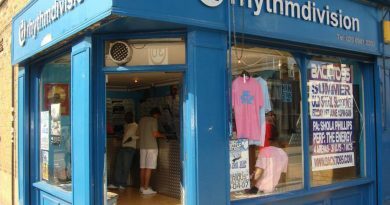 Nowadays, Roman Road Market operates on Tuesdays, Thursdays and Saturdays, but shops are open all week. Many historical shops are still trading along the Roman Road as they have done for many years, including Dennington’s florist, George’s Plaice fish and chip shop, L Randolfi’s cafe, Percy Ingle bakery and G Kelly, the pie and mash shop, which is currently being restored and will reopen soon to the delight of hungry East Enders. For more information on the opening times and days, see Roman Road Market. If you liked this, you might enjoy our photographs of Roman Road Market then and now.